Born in South Africa in 1982, Kim grew up on smallholding where she developed a love for the outdoors. A love for Africa, its wildlife and people grew in her from a young age. From as early as the age of 8 she used to wonder off armed with her pencil and a stack of paper, drawing every bird and animal she saw. From early on she began studying art but is mostly self taught. She has worked in many mediums, at the moment her preferred medium is acrylic and oil. Her inspiration comes from Africa and the landscapes, the rural countryside and it's people and animals that inhabit this beautiful continent. Kim is trained in interior design using her artistic eye to decorate some beautiful homes. She has also created some fantastic murals for Lodges, Bed and Breakfasts, Businesses and people's homes. 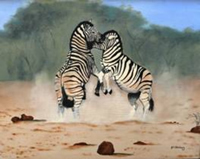 Recently Kim began experimenting with mosaic work but her passion is in oils on canvas. Kim currently works in a forest on the beach in the beautiful village north coast village of Mtunzini, South Africa. The forest and its birdlife and insect life is a place to "meditate and clear your soul" says Kim, she goes on the add that, "Painting has become a vehicle to express my thoughts, emotions and passions using the visual language of art. It has allowed me to discover who I am and find out what I have to say. I feel the connectivity of one thing to another and try to express these connections. I am inspired by the play of light, shadow, sheer colour, movement and atmosphere." You can expect top quality work done in fine oil or acrylics portrayed on mounted canvas by this new up and coming artist who is fast becoming a local celebrity in her home town. Kim is available for commissions of your favorite holiday photographs and memories. 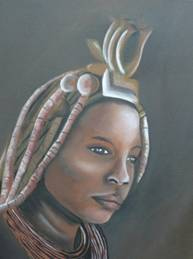 We will be updating this page regularly with new works from this talented artist. Art agents are welcome to contact her.